Roll the dough into a flattened ball, and wrap it in plastic wrap. Deposit it in the refrigerator to chill for at least an hour. I pulsed the nuts and cranberries (separately) in my cuisinart, and zested the oranges with my microplane. You want identifiable bits of cranberry and nuts – not a paste, or distractingly big chunks. This should make a thick, syrupy paste that’s just barely spreadable. Roll out the chilled dough on a flexible surface. I used a Silpat, but waxed paper, parchment, or plastic wrap are also fine. You’ll just need to be able to roll the dough up later without tedious de-sticking. Don’t flour the mat or your rolling pin – the dough is greasy enough that it shouldn’t stick hard. Roll and shape the dough to create a roughly 10″x10″ square; the dough should be about 1/4″ thick. A handy note: measure your hand span and other physical metrics for easy measuring and estimation. Because I know my outstreached hand measures 9 inches thumb to pinky tip, it’s easy to identify a 10-inch square. Scoop the brown sugar mix and spread it over your dough. Make sure you’ve coated the entire surface – it’s the “glue” that will help keep your filling in place. Spread the cranberry-nut filling evenly over the sugared dough. Leave about 1/2-3/4″ clear at either end of the dough in preparation for wrapping. This will keep the filling from bunching in the center of the roll, and allow you to properly seal the end and prevent dreaded filling explosions. Remember when I said to use a Silpat or other flexible sheet for rolling? This is when it all pays off: start rolling the silpat, and peel the dough off as you go. Roll the dough into a cylinder, continuing to peel from the silpat as you progress. This will get even easier as you go along. Be careful not to introduce air bubbles, as this will create holes in your cookies. 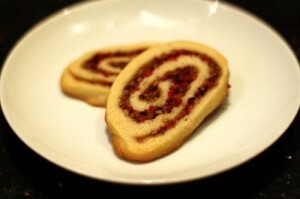 The dough should be pressed gently but firmly against the filling – think cookie sushi. When you reach the end, run your finger along the edge with gentle pressure to seal the end of the dough into the roll. Keep rolling your dough over right onto a sheet of waxed paper. Tuck the ends to avoid spilling any filling, and put the whole roll in the freezer. If you’re going to leave it longer than a day or two, add a layer of aluminum foil. Use a large, sharp knife (non-serrated) to cut the still-frozen cookie log into 1/4″ thick slices. This is about 6-7mm for you metric folks. If the cookie roll cracks, let it soften a bit on the counter; if it mushes, return it to the freezer to resolidify. Spread the cookie slices on an ungreased baking sheet, and bake at 350F for 12-15 minutes until the edges are just golden brown. These cookies don’t spread too much, so 1/2″ spacing between unbaked cookies is fine. Allow the cookies to solidify on the baking sheet for a minute or two, then transfer to a wire rack to continue cooling. If the cookies deform or tear as you remove them from the baking sheet, wait longer before transferring. I like these best served warm, with a cup of hot cocoa. I’m told they’re also good dunked in milk, and they’re certainly delicious served cold. To store: cool completely, then store in a sealed container. Like any good Christmas cookie, these are fine to make ahead and store for parties, but somehow mine never seem to last that long!